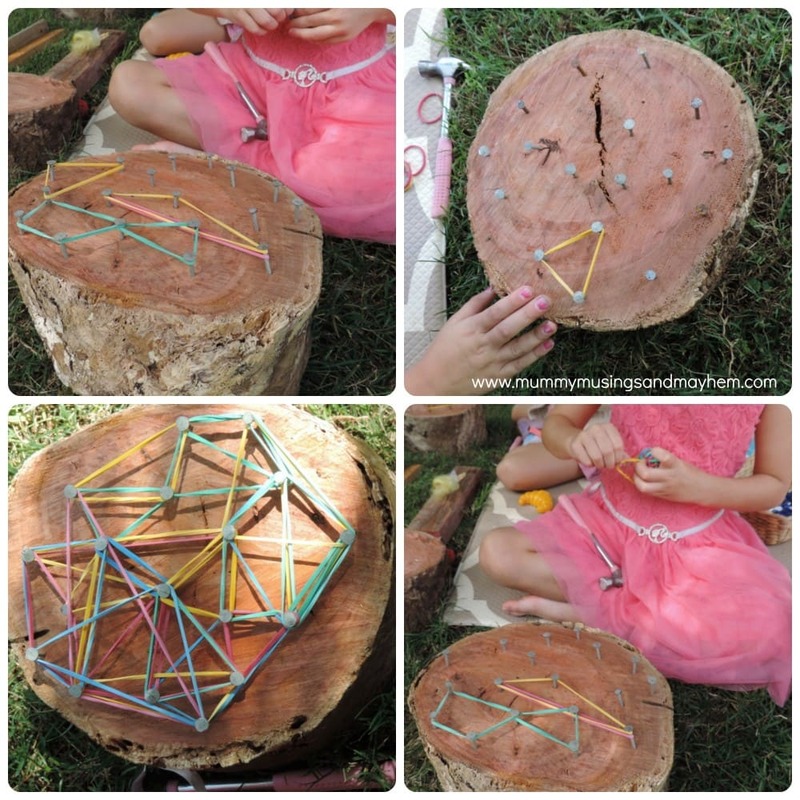 Wooden Stump Geoboards – Taking Math Play Outdoors! 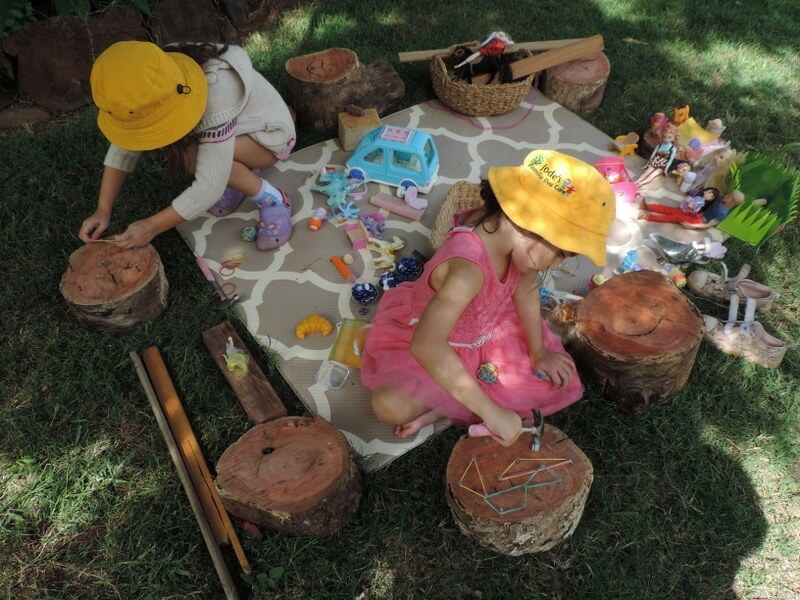 Outdoor play provides many opportunities for children to investigate, problem solve, learn new skills and challenge themselves. I love thinking of different ways we can get outside and continue to try new experiences. 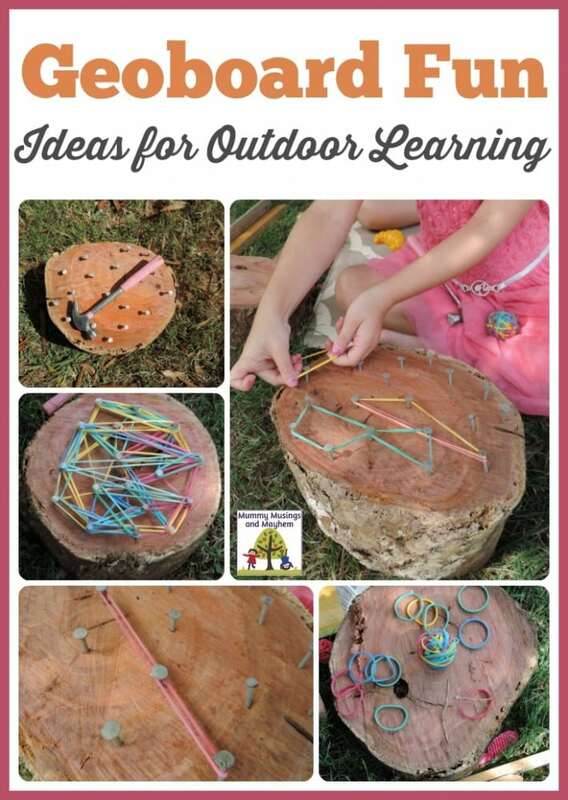 Just because an activity may usually be done indoors doesn’t mean educators and parents can’t consider new ways to take the play outdoors ! My twins have been showing a keen interest in using real tools lately. They do a lot of little projects with their Dad and even have their own toolboxes filled with real tools just like Daddy does. Working with tools is definitely not a gender specific activity and shouldn’t be treated as such! 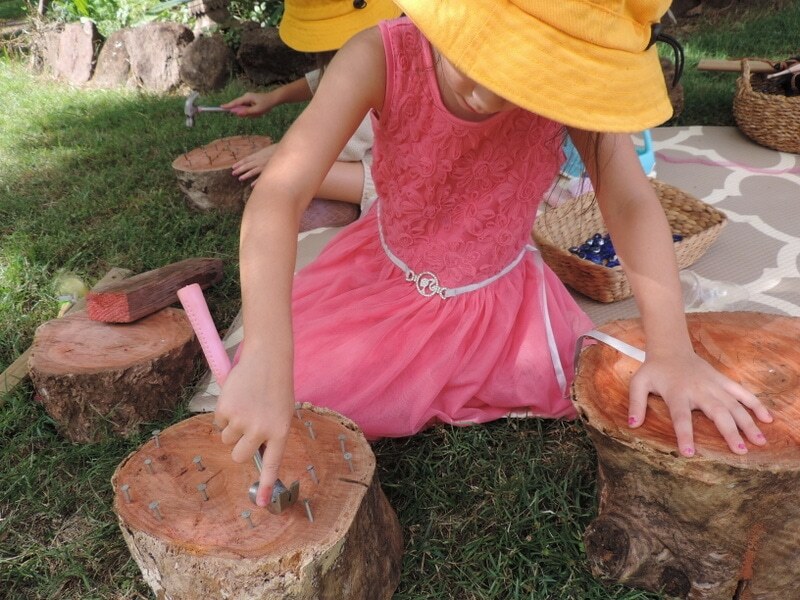 They have been practising their hammer and nail skills recently and I thought it might be fun to incorporate their love of making patterns and shapes while strengthening those eye hand coordination skills! We recently watched while His Patient Self used the chainsaw on an old eucalyptus tree that had fallen to make us some stumps and large tree cookies. 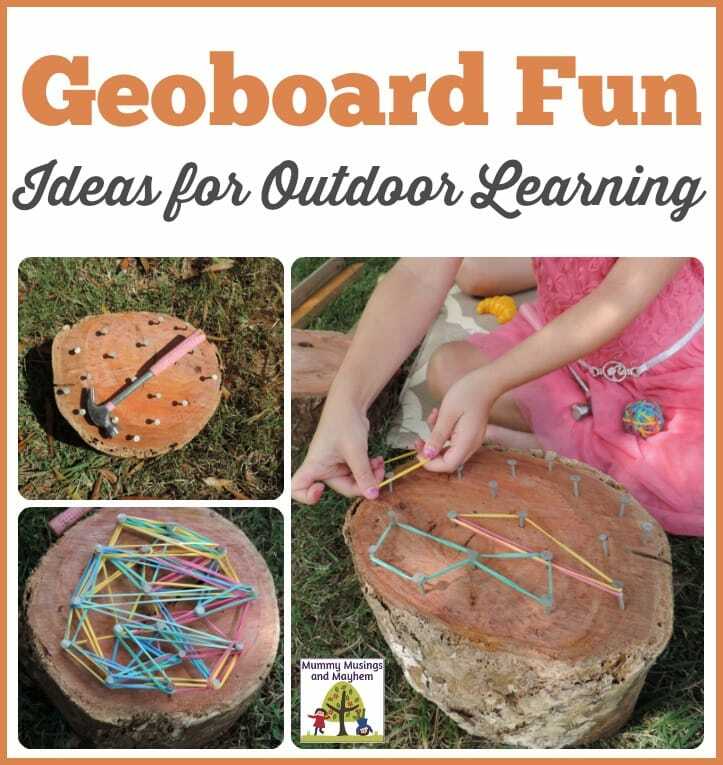 I knew immediately that I could use a few to make some stump geoboards. 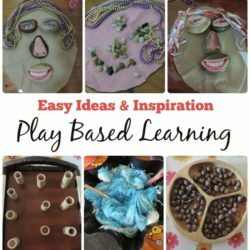 They are so easy to make but children really enjoy being involved in the process from start to finish. Want to make some too? Here’s how we did it! First find yourself some wooden stumps or even just scrap wood offcuts (Landscapers and tree loppers are good to approach). We are lucky enough to have a lot of fallen branches and logs on our property and His Patient Self is trying to get used to using the chainsaw so of course I had to give him a project to help him 😉 I requested some stumps of varying thicknesses as I want to use some for an obstacle course in the backyard (as you do!) I chose the smaller ones for our geoboard project. 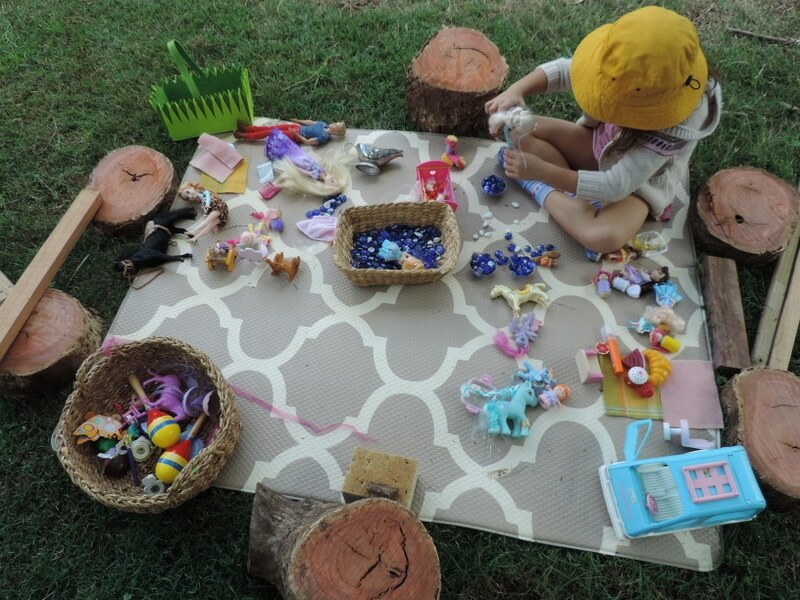 The girls also insisted on setting them up around their mat to use as stages for their dolls as we played outside! I’ll share more about making some sweet little twig ladders for the stages soon in another blog post! Grab some large nails and a few real hammers. 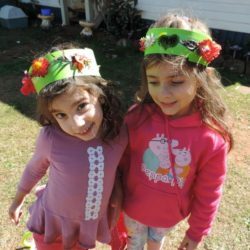 I have some smaller ones for my girls and also have used them with toddlers in my Family Day Care service – yes toddlers! 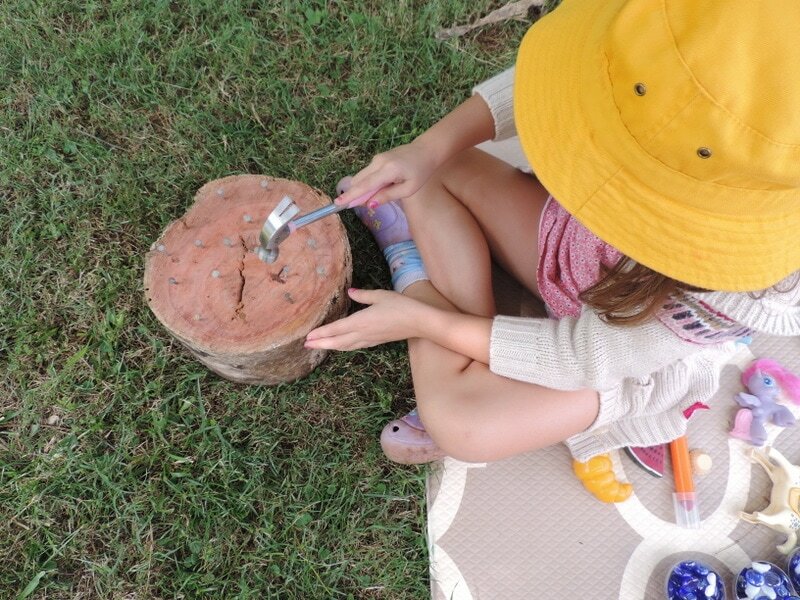 With guidance and supervision hammering with real tools can be such a valuable experience for older children as well as younger toddlers. 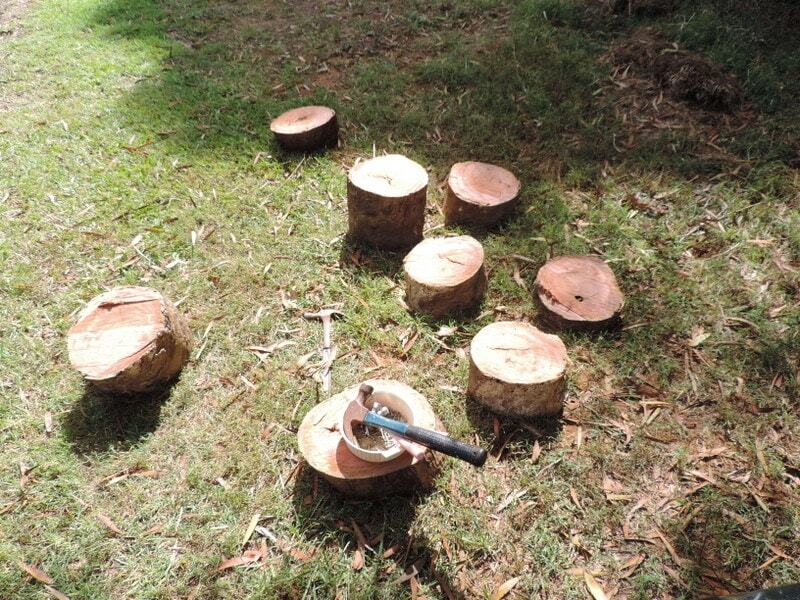 Start them off by hammering some nails into the wood until they just grab and become fixed into the stump. 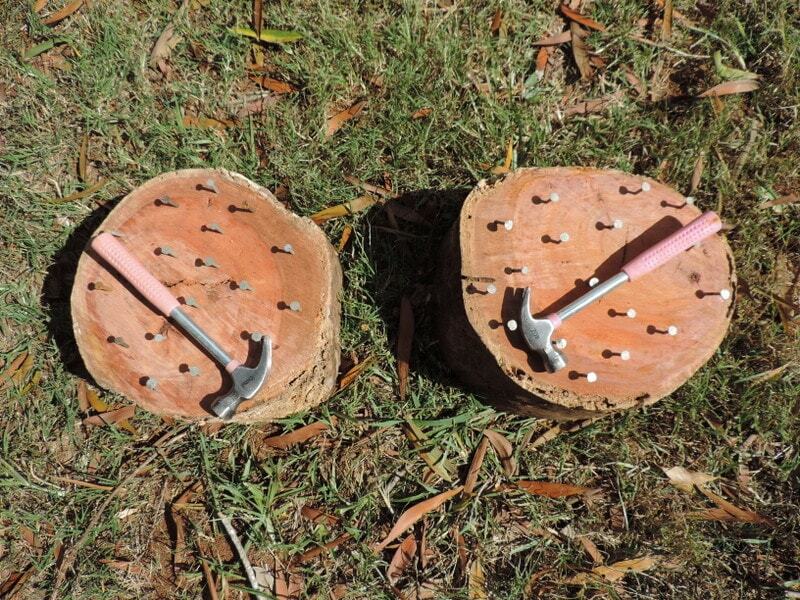 Then hand out the hammers and let the children keep hammering until they are firmly wedged. 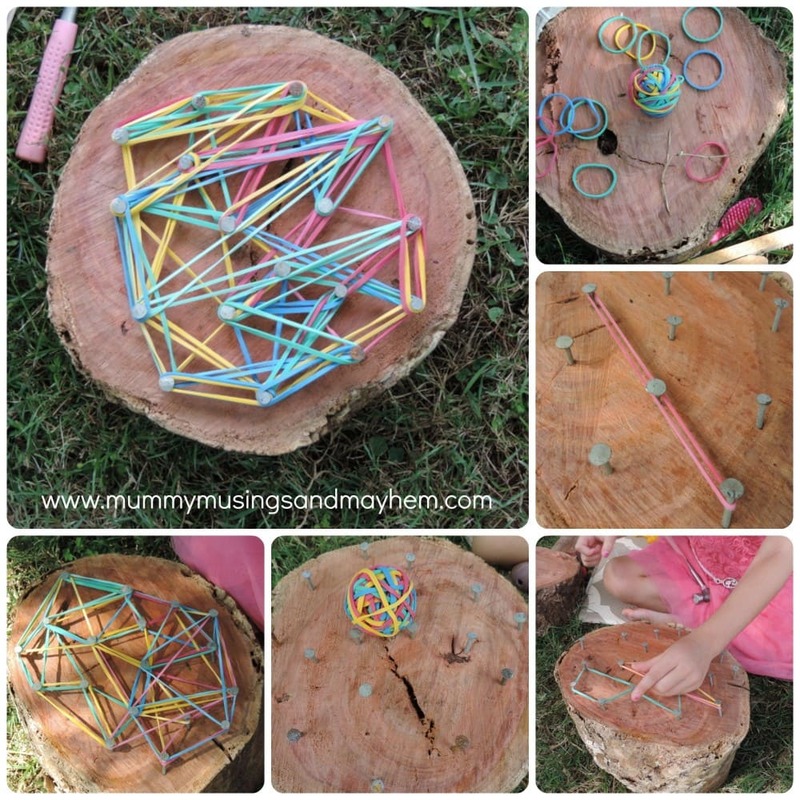 In reality they probably won’t move the nails much depending on the type of wood but they will think they are and will enjoy lots of practice using those fine motor, spatial awareness and hand eye coordination skills and that’s what counts! This was serious business and Ruby even tried to remove a few nails to move their position. I love that she has learnt how to use the claw part of the hammer to remove nails…and that she insists on wearing her ‘favourite pretty dress’ to do her hammering in! They really took great pride in hammering the nails and getting them just right. 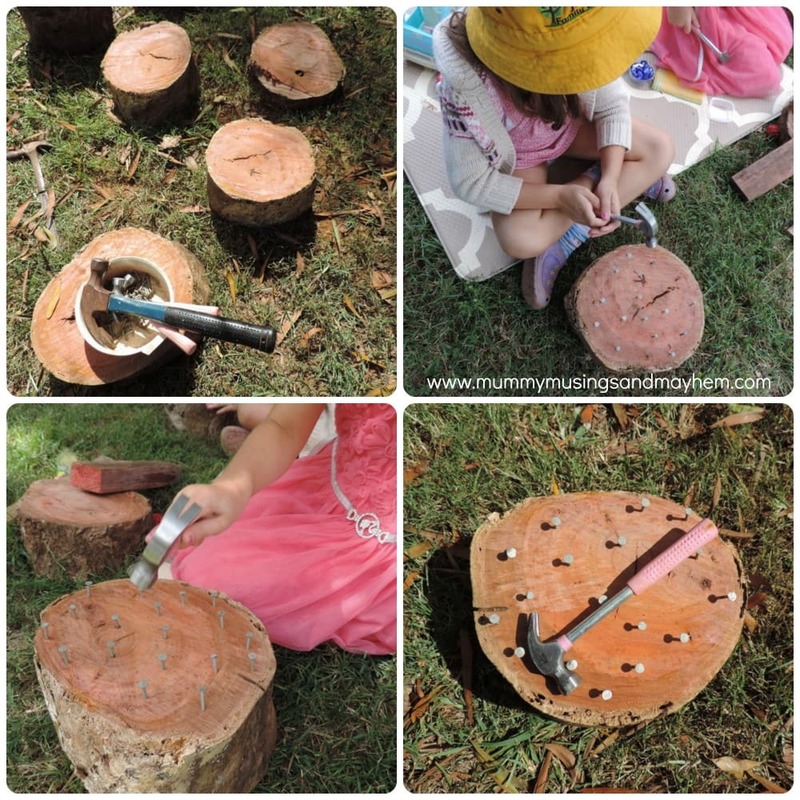 Toddlers also love this sort of activity and I encourage you to let them be involved because they will probably surprise you with how focused they become and their isn’t actually a ‘wrong’ way to do the hammering. Well unless it’s on another child’s head but that is rare with positive guidance as they are so focused on the task you have shared with them I promise!! I let them tell me when they were happy with their work and felt like they were ready to move onto the next step. It’s important not to rush children as they work. As an educator or parent (or both) you might have a plan in mind to reach the end product but it’s essential to let them work through the process at their own pace and feel that sense of satisfaction of getting their project ‘just right’. When they are happy with their nails and you have made sure they are all firmly wedged into the wood – while still allowing some room for the heads of the nails to be above the wood (don’t let them hammer them all the way in!) you can pass out the rubber bands. 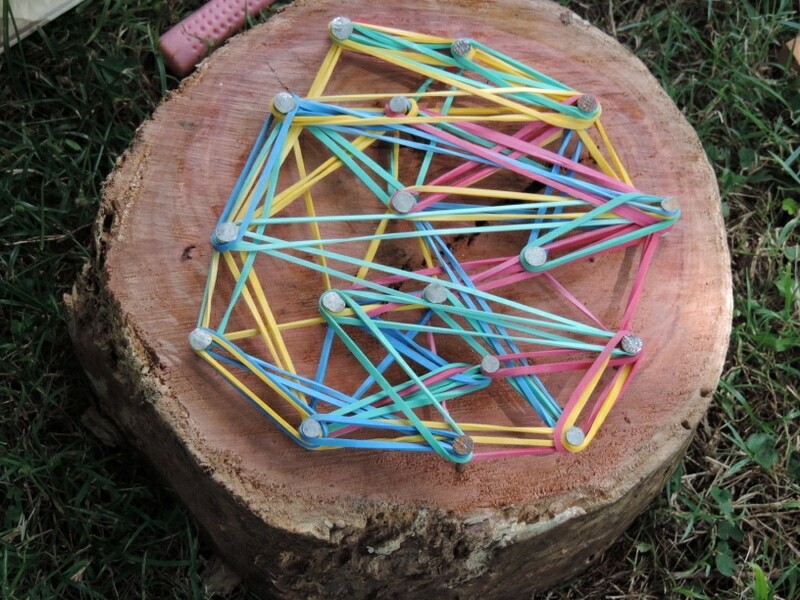 I like to get the balls of rubber bands from my local Woolworths as it provides another little challenge for those fine motor skills as they work to peel each one off the ball. Also allows each child to have their own little stash of bands to use as they want to. Mine like to be able to choose the colours they will use and how they use them. Then it really is time to leave them to it to get creative and experiment with colour, patterns and shapes as they hook the bands from one nail to another. You might sit back and watch or join in a discussion about the colours, shapes and patterns being created. The twins really enjoyed telling me about the shapes they were making on this day. We talked about big and small triangles and how to make some that were the ‘same’ and then ‘different’. It was fascinating to watch how engrossed they became in creating their patterns and how they chose to use the bands. They work in very different ways as Ruby prefers to just mix everything up, change the pattern and colours every few minutes while Tara is very deliberate with the colours she chooses and patterns she makes. 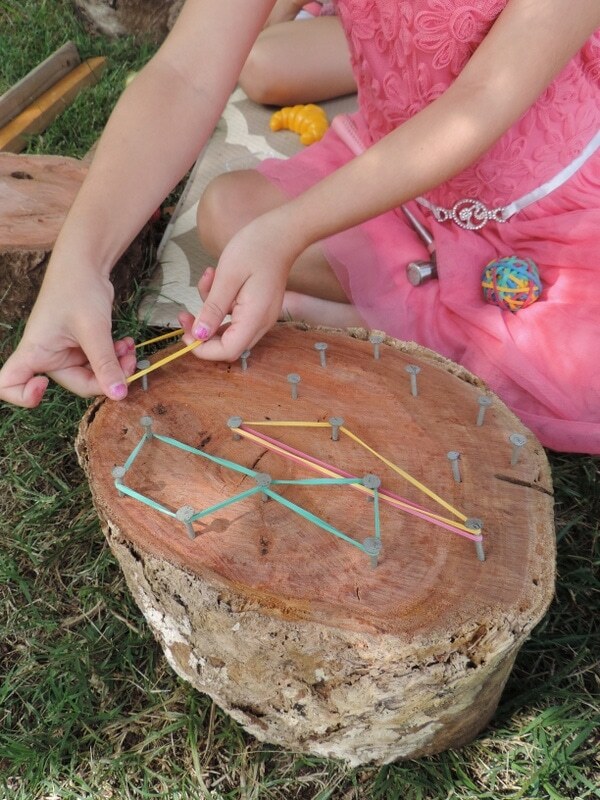 Fascinating to watch how children choose to work in different ways with the same materials. To keep a record of the wonderful creations each child makes I suggest taking lots of photos and then displaying for the children to discuss with friends, family and carers. I realised how old my girls are getting when they both told me I should ‘put the picture of their stump on my blog to show other kids how to make one too!’ When did they get so wise? 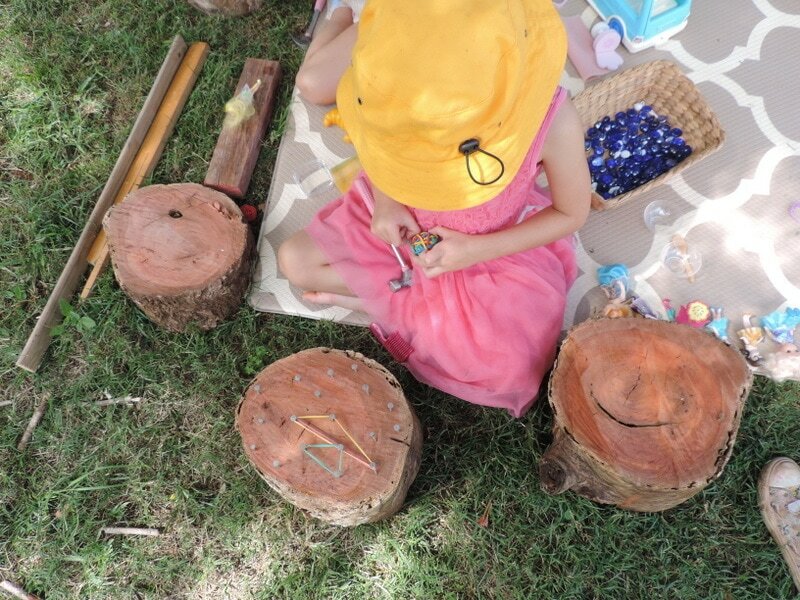 It really is a very simple activity but one that embraces and supports outdoor play, natural materials, independence, self expression and creativity. 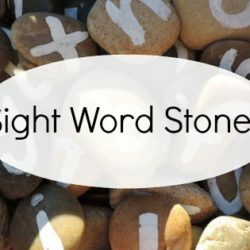 Why not give it a try this week? 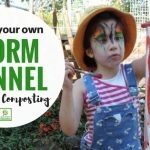 Sustainability in the Garden – How to Make a Worm Tower! I have just started my family day care . I have my 3 children I my care along with my 3 girls age 5 and 8 yrs old. 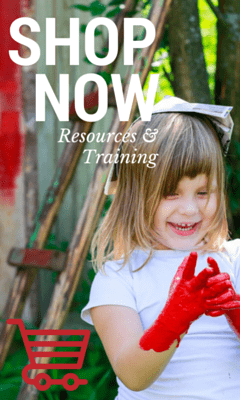 Your work is amazing and it’s got so much information helpful when you are passionate to provide children with the best opportunity in life through their childhood play. Thank you so much. Thank you for such lovely feedback Zarina! 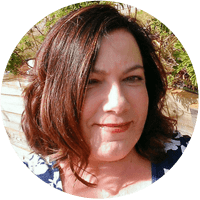 I’m so glad you are finding what I share helpful for your role with FDC – I love being able to connect and reach other passionate educators such as yourself!